Part-Maori unemployment still needs a lot of work despite big drop in figures, says one of New Zealand’s most rabid racists and Minister of Employment Willie Jackson. The falling unemployment rate is tracking in the right direction but the percentage of part-Maori and youth out of work is still too high and the reality was that employment for part-Maori was still 9 per cent – double the national average. Mr Jackson said part-Maori would benefit from government investment in families, health and housing, but he was also negotiating targeted initiatives. “There’s a dual strategy where there will be specific funding that the Minister of Finance has committed to support – I’ve been talking to him over the last couple of days,” he said. Ahhhhh, remind me again, weren’t all those taxpayer-funded billions of dollars in dubious Treaty Settlements supposed to fix the problem of part-Maori unemployment? long time passing . . . ? It’s hard to get fourth and fifth generation welfare benefit recipients of Maori descent back into the workforce especially if they do not want work. That’s why they are bringing 400 Filipinos to work on the construction sites up in Auckland. Wayne, you forgot all the people from Tonga and Vanuatu who come into the Eastern Bay of Plenty and other areas to plant, pick and prune etc Kiwifruit on part-Maori land. I debated with a Labour member at a meeting before the election and he complained about the high unemployment in and around Opotiki. I said there should be nearly none with all the kiwifruit development, but all the jobs were being done by people from the Islands that should be done by part-Maori. He replied that the part-Maori people don’t have the skills to do the work. My response: do you think the Island people who come here to work have skills when they arrive, his reply: it’s not that simple. Of course it’s simple. The local part-Maoris want handouts, not workouts. The islanders want to work. Our Willie is a silly man so one cannot expect anything less or more than silly comments from such a silly man. Where do all the unemployed part-Maoris live? Yep, that’s right: exactly where one would expect them to be. Where there isn’t any work. I had to chuckle, but that’s not fair to the bulk of the hard-working, upright part-Maoris in NZ. Just the money-grabbing iwi elitist, snout-in-the-trough lot. Willie Jackson has the most appalling racial attitudes and no doubt his so called ‘solutions’ to the unemployment problem amongst part-Maori will be just what you would expect – throw taxpayers’ money at the problem. If part-Maori is still a race, the only characteristic which identifies many of them is a commitment to work-ing the system, and boy, have they got that in spades. Why our gutless politicians continue to pander to this nonsense is beyond me and I don’t think many of them are aware of the growing discontent among the populace. I did warn my local Nat MP that they would lose the election because of it and I’ll bet Labour will be a one term trick pony as well for the same reason. I have tried to debate issues related to part-Maori privilege with my Nat MP but he really knows very little about the subject and on a vital matter was actually obliged to say that he was wrong. What really puzzles me is that the Nats generally seem to think that once all of the claims are settled (never going to happen of course) everything will be sweetness and harmony. 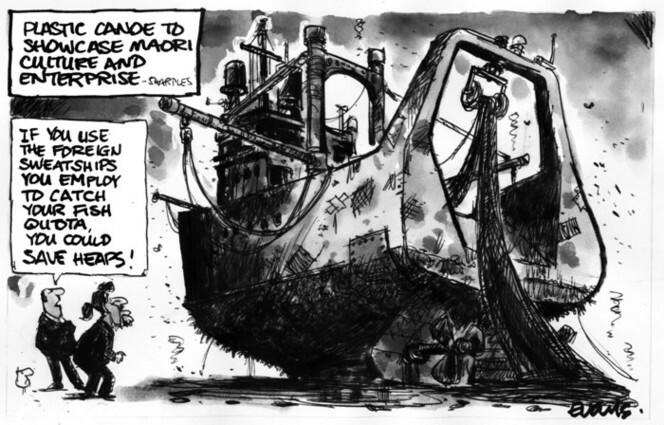 The other side of that is John Key saying that if they did something – was it abolishing the Maori seats? – there would be hikoi from hell. What sort of spineless MPs have we elected and why? Then of course we have total liars like Winnie . . . . .